Linda attended the Institute of Integrative Nutrition in New York City and graduated in 2012 as an Integrative Nutrition Health Coach. In 2015 she became certified through the Dr. Sears Wellness Institute and is accredited by the American Association of Drugless Practitioners. Linda is a contributing writer for Yahoo Beauty, a speaker on various health and wellness topics in corporations, schools and community centers. Working in this field is much more than a job to Linda. Her passion shines through as a health educator as she coaches and encourages clients through personalized & group programs with care and energy that is second-to-none. Linda helps individuals improve their health in simple and attainable ways by helping clients make small, gradual changes through introducing healthy eating habits and living practices specific to their body and lifestyle. With Linda’s help, clients take control of their health. Most important, she works to partner with her clients to create realistic personalized plans of action that support both short and long-term health goals. Linda has special insight into your weight loss journey, as she, too, was once a junk food junkie and weighed 40 pounds more than what she weighs today. Through her journey of discovering all of the benefits of a healthy lifestyle, she has overcome weight gain, digestive disorders, low energy, muscle and joint pain, insomnia and autoimmune disease. As a former teacher, Linda uses her background to fuel her approach by individualizing your health education and weight loss program. She will listen and plan a program to meet your unique needs and address your specific concerns. Linda is also a licensed Neuromuscular Massage Therapist and a certified Pilates Instructor, so she knows everything that is body related. She serves on the local school Wellness Committee. Her hobbies include cycling, Pilates, crafting, cooking and spending quality time with family and friends. Email me at linda@simpleandwell.net or call 312-882-2020 to set up a FREE 30 minute call to see if health coaching is right for you. By working in fields that have been all about the body, and practicing along side my husband who is a Chiropractic Physician and Functional Medicine Doctor, I have been witness to our patients healing through good nutrition, proper supplementation, physical therapy, manipulation, corrective exercise, and life-style change. Watching our patients transform, as well as following the same programs myself, I have seen my own health improve and have experienced sustained weight loss. Through doing these programs myself, along with participating in quarterly cleansing, my body has reset itself to a weight that I have not seen since high school. I no longer pound the pavement of harsh exercise, nor do I diet or deprive myself to get there. My health journey began anew when I watched our patients transform their own health and lose weight—it changed me. I am testament to living a sustainable yet, “not perfect” lifestyle. I have been trained in more than 100 dietary theories and studied a variety of practical lifestyle coaching methods. 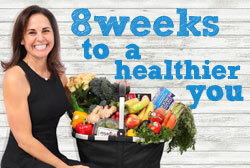 I teach my signature program, “8 Weeks to a Healthier You”. It is made up of a curriculum that has changed countless individual and group client’s lives. I also teach the Dr. Sears L.E.A.N. programs for families and kids, Prenatal & Postnatal Nutrition and Prime Time Health for later adulthood. In my practice, I focus on empowering my clients to realize their potential for a healthier lifestyle. I have helped countless people improve their eating habits, stop cravings and binges, feel better about their bodies, reach their ideal weight, experience increased life satisfaction, and find their passion in life. You don’t do this by counting and talking only about calories—it’s about your overall life – building genuine relationships, creating a community of support, and nourishing gradual, realistic change. I realize that everyone’s journey is different. I am not here to judge or to present clients with a cookie cutter manual of generic and unrealistic advice. Rather, I aim to empower clients to reconnect with food, their body, and supply the right tools and confidence to be successful. Health and wellness is about loving who you really are and embracing the challenge to discover your best self. It is my honor and pleasure to encourage and coach clients as well as to be their trusted advisor. The biggest thing that being a health coach has taught me is that all of the knowledge in the world is useless if you don’t know how to implement it. Many of my clients have read book after book and still are very confused as to what to actually do, or they keep trying one thing after another. The journey of a healthier lifestyle unfolds in the time that we work and partner together. The process may not always be easy and I may have to call my clients on certain behaviors. They end up, however, with real, long lasting results when I do step in and challenge them. I am like a proud mother, mentor, and cheerleader. It feels wonderful to make a difference in their lives and the lives of their families, too! As a wife and busy mother of three, I know how stressful it can be to plan and prepare healthy food for your family while trying to maintain a career. It is my passion to personally live a healthy lifestyle and inspire others to do the same. Subscribe today and get a FREE 20 minute call to see if health coaching is right for you.